Despite spending more than 6 summers now in the French Alps, one of the activities that we had yet to try was the Fantasticable in Chatel. So when some of our guests told me that they really wanted to give it a go, I thought that it would be a great opportunity to do a bit of ‘quality control’ and see what it was all about! 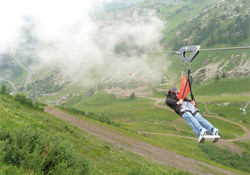 For those not in the know, the ‘Fantasticable‘ is basically a glorified zip-wire (two wires actually) which runs 200m above the Plaine Dranse valley in Chatel. You get strapped in ‘Superman style’ and then get flung across the valley at speeds of up to 120km/h before coming to a somewhat abrupt (yet exhilarating) stop at the end. It’s not for the fainthearted, but is definitely one of the things that should be on everyone’s ‘Alpine bucket list’! So first up (rather bravely I might add!) 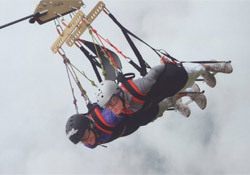 were Barbara and Holly who went together in a tandem flight. They did a great job of putting a brave face on it, but their screams as they set off down the valley perhaps belied their true state of mind! It was quite a misty day, and watching them disappear into the fog as they hurtled across the valley added a somewhat surreal element to what was already a fairly nerve-wracking experience. Next up was Matt who seemed to take everything supremely in his stride, followed by John and then Phil who both looked like they were absolutely loving it! Dennis was on hand to take some great photos and to lend some much needed comic relief! So finally it was my turn, and I’ve got to admit, I was slightly bricking it! Obviously I’d seen the others go ahead without any problems, but it’s that fear of the unknown that is still so scary. It didn’t help that literally seconds before I was about to depart my phone started to ring, and I had thoughts of Cat desperately trying to call me having had a bad premonition about the turn of events! Fortunately, everything turned out well, and I can honestly say that it was one of the most exhilarating things that I have ever done! It really gives you the feeling of literally flying through the air, and it also lasts a surprisingly long time, so you can really take in your surroundings along the way. I would have absolutely no hesitation in recommending it to anyone who considers themselves a bit of a ‘thrillseeker’ and at only €34 (plus a further 20% off with the Multipass) it’s great value for money. Cable 2: 1,323m long, max speed 120km/h!! I would like to take this opportunity to thank the Coulson family, without whose adventurous spirit I might never have taken the time to try out this thrilling, once in a lifetime experience!